I had a thought after seeing a show where a woman was making braciole and I had a thought, could i do this with shrimp. It started as a rolled dish and slowly evolved in my head as I road back and fourth each day from SF to Oakland last week. The thought went from something rolled like braciole to more of a cannelloni, then from a cannelloni to something more of a pasta sheet, then finally just a sheet. 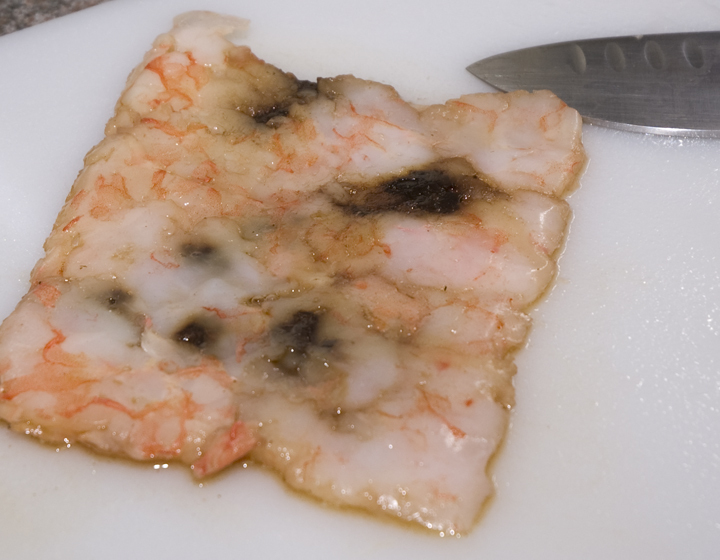 A sheet a shrimp molded together to form a single piece of protein. 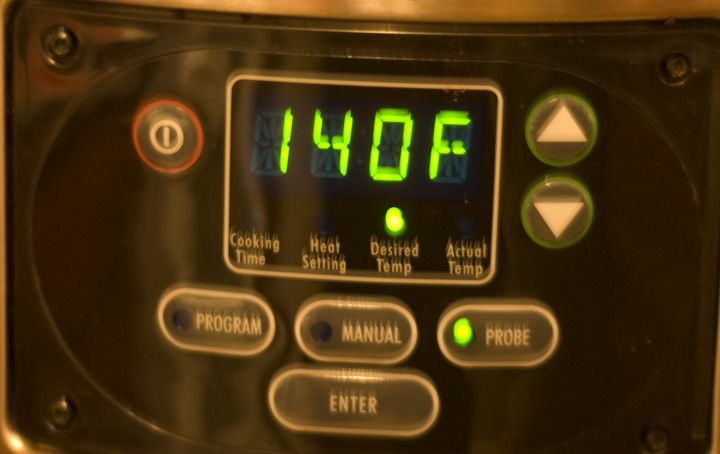 After about 20 mins it came up to temp and I shut the power off so it could cool slowly. The result of the slow cooking water bath was a single unified “protein” that could be cut and shaped as I wanted. The black garlic seeped out while cooking and flavored the entire sheet, adding a bit of garlic sweetness throughout the entire piece. 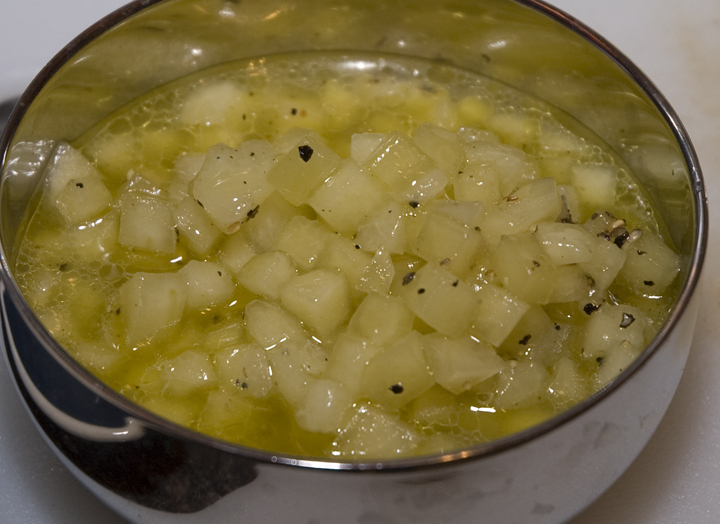 The honeydew melon was mixed with the olive oil, vinegar, salt and pepper, vacuum sealed and cooking in the same manner but at a lower temperature so that I could retain the shape and texture. 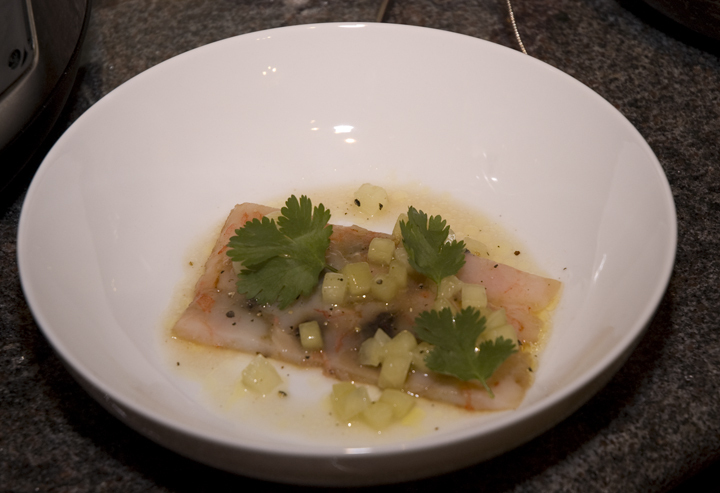 the final product was a piece of honeydew that was hot to the touch but retained all its original characteristics. The olive oil and rice wine vinegar were infused into the melon giving it a pickled flavor with hints of grass from the oil. The final product. 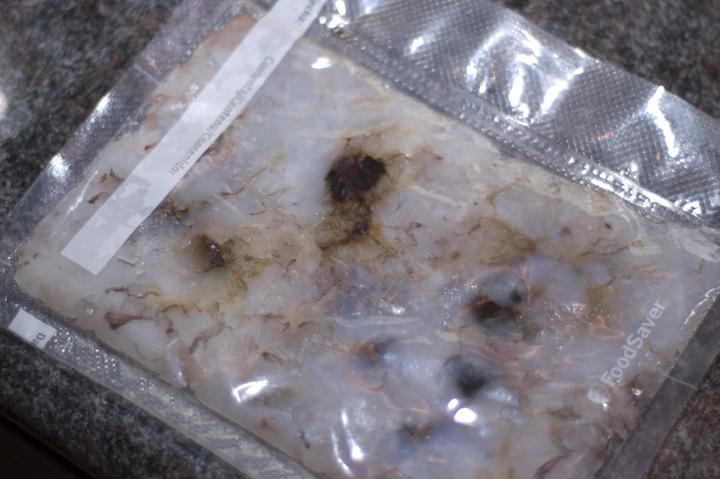 I cut the shrimp into a 2 by 5 inch rectangle. brushing some of the liquid from the melon over the shrimp, placing a few spoonfuls of melon around the bowl, some cracked black pepper, and a few cilantro leaves. the final flavors were different then expected but almost to where I want them. The sweetness made the shrimp tasty more of the sea while vice versa the shrimp made the melons taste more of melon. More to come of this I am sure, this is only the beginning.